Our evening at TWO urban licks was beyond anything either of us could have expected! Welcome back to our Top 10 Atlanta Restaurants "By the Numbers", a new monthly series by wanderlust ATLANTA and super-popular food Instagramer atlantafoodie! Our second stop on this 10-restaurant tour was TWO urban licks, the first time either of us had been. What we believe is a unique spin on 'Top 10' lists, we're not counting down, but instead we're showcasing some of Atlanta's restaurants with numbers in their name! Some we've been to before and others will be a first-time experience. We're going to make all of them FUN! Instead of discussing the dishes in the order they came out of the kitchen to our table, I want to talk about the biggest surprise, for me, of the evening's featured dishes. After perusing the menu, our totally awesome server, Allea—pronounced Allie—asked if there was anything we didn't want. Nikki and I eat pretty much everything—and wanted a "Chef's Choice" experience—however the Steak Tartare wasn't speaking to me, so I asked that we enjoy anything except that, but I'm sure it's a lovely dish. As it turns out, the only other dish on the menu I would have skipped were the oysters. I've only had a few in my life and those weren't these. 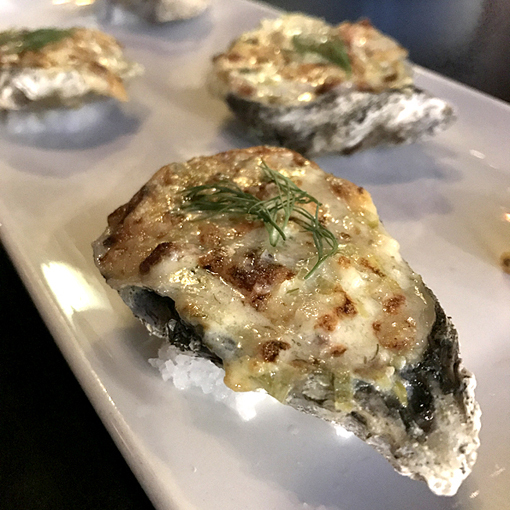 The "Baked Oysters", with leeks (a favorite ingredient), dill, bacon and grana padano (an Italian cheese), were amazing! I never, ever thought oysters could be so delicious! The 'bread for the table' is a wonderful indicator of just how fabulous your meal is about to be. 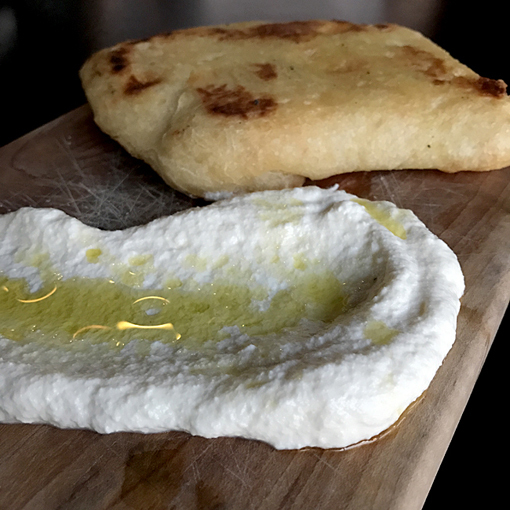 The exotic flatbread and house-made ricotta with olive oil is a dangerous start...only because it's so fantastic that one could easily fill up on it before the main meal arrives. But don't dare skip this exquisite bread and luscious ricotta. Nikki said, "I was really blown away by the Salmon Chips. The flavors and quality of salmon were excellent and the portion size is almost ridiculously generous!" The Salmon Chips have been on the menu since TWO urban licks opened nearly 13 years ago and I got the feeling that there would be a revolt if they're ever removed from the menu. Chef Michael Bertozzi told us that if something works and guests love it, he's not going to change it! The Salmon Chips are served on an elevated plank and they are indeed HUGE! 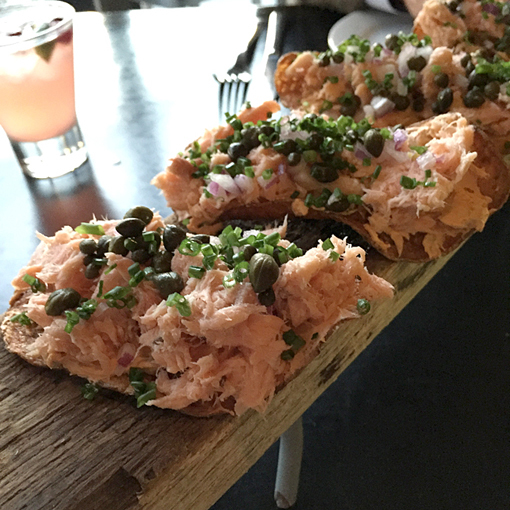 They're made with mountains of smoked salmon, chipotle cream cheese, caper and red onion. Personally, I love salmon, and these were a major treat! I'd never had Poke, but Nikki's been talking about it for some time, so I was already primed and anxious to try it...not knowing it was going to be on the evening's offering. 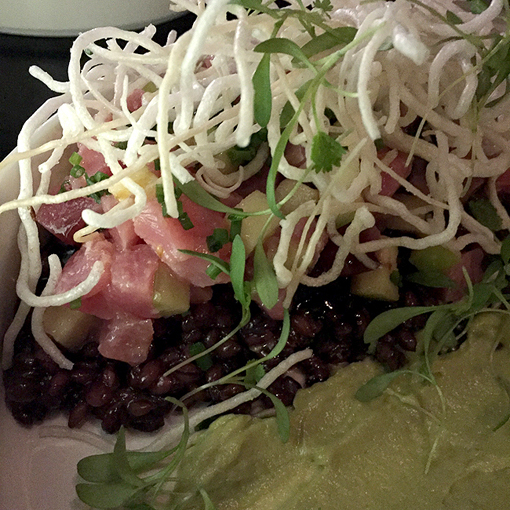 The Tuna Poke dish features black barley, granny smith apples, a smear of avocado, crispy noodles, sesame, and miso vinaigrette! This combination of flavors is magnificent...I hope no one witnessed it, but I was doing a happy dance right there in my chair. Seated, of course. 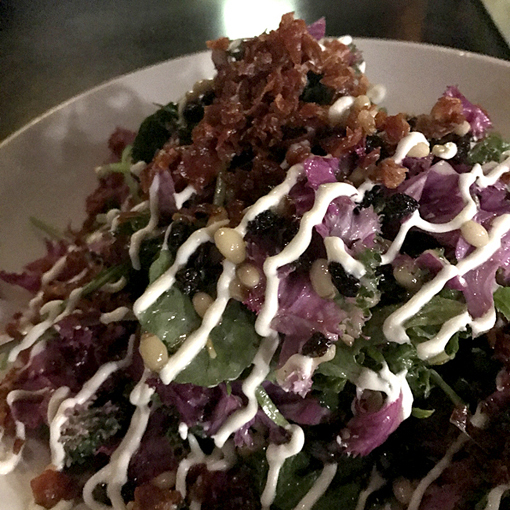 TWO's Kale Salad has currants, pine nuts, goat cheese, sherry honey vinaigrette and it's topped with an insane amount of crispy prosciutto! This was only the second time I've enjoyed Kale Salad and I truly, truly enjoyed it...not just because of the insane amount of crispy prosciutto. I totally could make a meal out of this salad. Like the other dishes, the portions are quite generous! Early on in our dining experience, Allea called one of the dishes "rad", an 80s slang word I'd not heard in years...especially coming from a young person! Allea is incredibly delightful and highly professional. She's magnificent at making guests feel special, as Nikki and I did. Allea used the word "rad" a couple other times that evening...totally awesome! 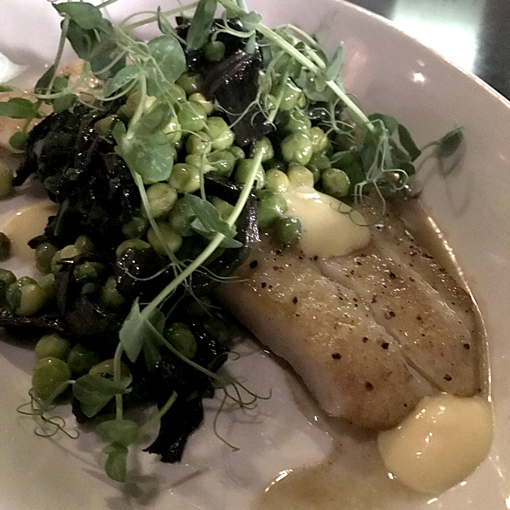 Nikki said, "The Seared Flounder with English peas is a simple dish, but it has a good flavor." I used to live in Jacksonville, Florida, where Chef Michael is from, and enjoyed quite a bit of Flounder, but never any as delicious as this! This dish is comprised of early English peas, green garlic, black trumpet mushrooms (I LOVE mushrooms!) and Sorrento Lemon curd. A little research will reveal that the Sorrento Lemon is the lemon of choice for the Italian treat Limoncello. In fact, Chef Michael shared that he had just put up a batch of Limoncello...that will age for 80 days before it's ready to serve! I need to mark my calendar! You can't miss the wood-fired and rotating rotisseries when you enter the restaurant...they're in the middle of this warehouse-turned-restaurant opulent establishment. The Beef and Broccoli dish is superb! 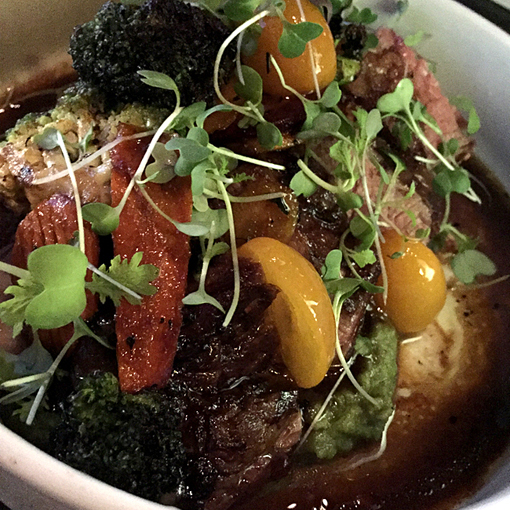 It's comprised of 48-hour short ribs, charred broccoli, romanaesco (that bright green broccoli that looks like a perfect representation of a fractal equation), rainbow carrots, pickled kumquats (I thought these were tiny yellow tomatoes, but was grateful to get something with so many health benefits), and sesame ginger. I'm not one who usually seeks out charred or smoked dishes, but this dish has converted me into a seeker. The flavor profile of this dish is, without question, pure brilliance! 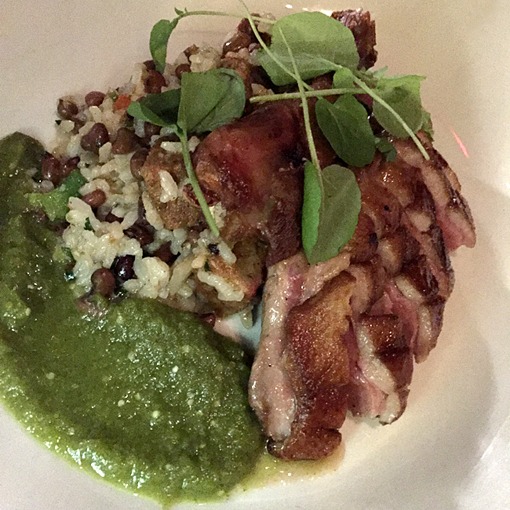 Nikki said, "I liked the unusual combination of duck, Hoppin' John and salsa verde, and especially loved the spices." Chef Michael shared with us that it's not only the customers who ask for the Hoppin' John to go back on the menu when it returns to in-season status, it's also his staff. And I totally get it! I honestly can't remember even a single Hoppin' John dish that I've had, but this one I will never forget. Count me in, Chef Michael, with your customers and staff who chant, "Bring it back! Bring it back!" There's not actual chanting that I'm aware of, but I'd be right there with them...this Hoppin' John is quite memorable! I've always thought of duck as an East-meets-West dish, although other cultures have embraced duck and perhaps perfected certain cooking methods, France being one of them. Duck is a dish that I enjoy ordering when I'm out and about. I was thrilled to see duck arrive at our table...the succulent breast meat is not to be missed. When Allea brought the Monkfish to the table and shared with us its ingredients, our ears pricked up! 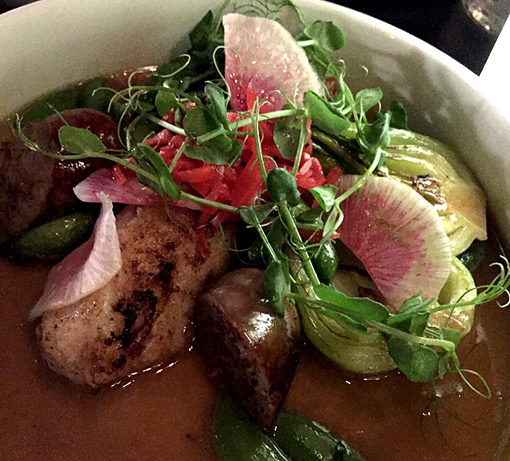 This dish is so much more than monkfish...it features Seared Szechuan Sausage, baby bok choy, snap peas, watermelon radish (a beautiful, tasty vegetable! ), and mushroom dashi. Chef Michael stopped by almost immediately, fortunately because we were curious about the sausage—Nikki wanted to know what made it 'Szechuan' and I was curious how it met certain Georgia laws regarding house-made sausage. Chef's explanations were spot on and we greatly enjoyed this dish...to the point of almost total annihilation! The sausage alone could be a meal for me, but I do love a dish that's a symphony of flavors, colors and textures...and that comes with a story! Chef Michael visited our table three times—we are so grateful for the VIP treatment and for how incredibly sweet Chef Michael is. Speaking of sweet, his third visit was to deliver the dessert course. He knew we were beyond full from dinner, but said that his Pastry Chef would not forgive him if we weren't served dessert...I'm so glad we were! Wow! 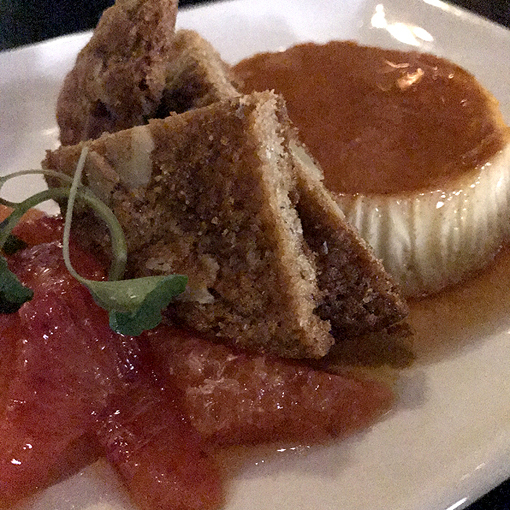 This dessert—Butterscotch Creme Caramel—is as fresh it comes! The Butterscotch Creme is silky and the butterscotch subtle...you totally get the flavor, but you're not being bombarded with too much sweetness. The Winter Oranges are bright and evidently picked at peak ripeness. The Walnut Cookie...I wish they sold these by the pound! Nikki arrived early and she didn't waste any time diving into the evening's dining experience. She nestled up to the bar and ordered a cocktail. Before I move on, let me point out that Nikki did not use the restaurant menu as a coaster. The bartender did. You see, their menus change frequently so the out-of-date menus are re-purposed. Some of them end up as coasters for the bar and some as "candlesticks" for the dining tables...quite clever, I think! They're a great conversation starter, whether it leads to discussing what's on that day's menu or commending the restaurant for their sustainability efforts. 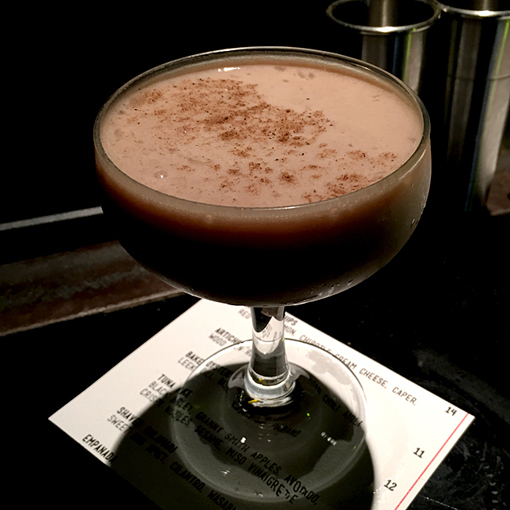 The first item on on the craft cocktails list is the "Jack's Alexander", built with Four Rose's Bourbon, house-made orange syrup, creme de cacao and cream. "I really loved my first drink, the Jack's Alexander. It was rich and creamy and chocolaty and felt like a dessert. The reason I chose this drink was because a portion of the proceeds go to Atlanta Community Food Bank," said Nikki. When I arrived and Nikki told me what she was drinking, I was shocked! She's not really a sweets person, but....she was loving this drink! She commented that she was "having dessert first", which is something I've never heard come out of Nikki's mouth. I'm totally having one when we go back! We were there to explore, so later in the evening Nikki enjoyed a second craft cocktail, "The Wise Man", built with Sage infused gin, house-made blackberry syrup and lime juice. 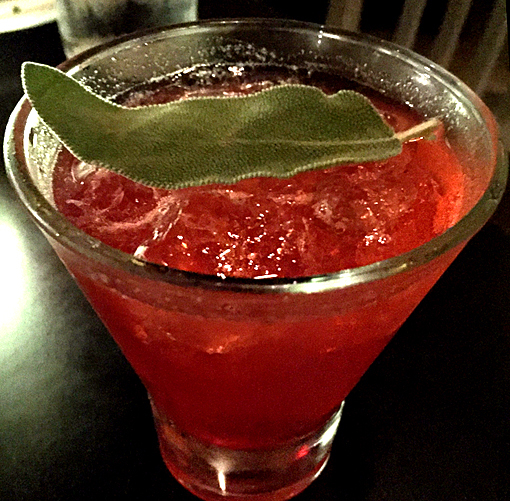 Nikki said, "'The Wise Man' is designed for the more seasoned gin drinker. The Sage infused gin had a lot of great, complex flavors. I'd have liked to try it mixed with something a little less sweet." It sounds delicious to me—especially the blackberry syrup—but, I'm more of a sweets person than Nikki. I started with a craft cocktail. When reading the drinks menu, being the space geek that I am, I stopped as soon as I came across the "Fly Me to the Moon". That it happened to be a vodka drink was a total bonus! 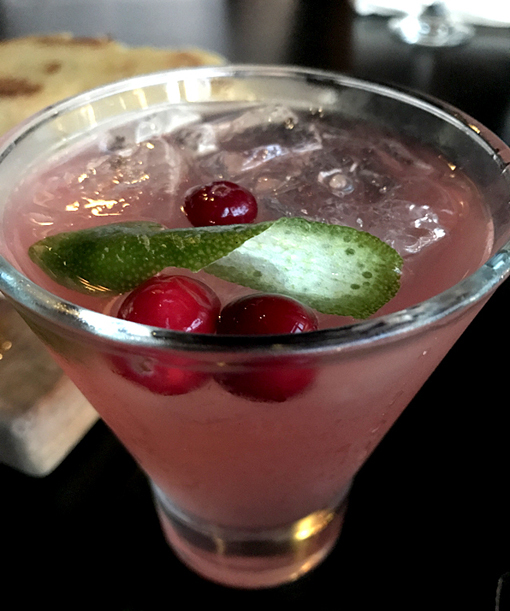 This one is built using cranberry and orange infused vodka, house-made cranberry syrup, pink peppercorns, cardamom (one of my favorite spices! ), and allspice. It sounds complicated, but my palate found it to be positively luxurious. After the first one, wanting to keep a clear head and fully experience the food, I switched to Sauvignon Blanc, which was excellent. Unfortunately, I don't remember the name. I asked for one that was dry and crisp and that's exactly what Allea bought me. TWO urban licks boasts the country's first 26-foot wine tower, which we unknowingly passed when we came in. It's pretty cool...if you're drinking white wine, like I was, it's poured directly from a barrel on that tower! The "Wow!" factors at TWO urban licks are well beyond what I've written. I highly recommend that you make reservations here for your next special occasion or even if you just want to share a special evening or brunch with someone. "Compliments to Chef Michael Bertozzi!" And compliments to Allea. Our first TWO urban licks experience was most incredible...it certainly won't be our last! When you get close to your destination, there's a trek through 'Gotham' that you have to make before finding the valet. It's not difficult, just follow the signs to "TWO". There's no parking lot, but their complimentary valet is quick! On the way to your table the host or server will hold your menus in the air while you follow them to your table. I didn't ask why, so when you do, will you let me know? Reservations are a good idea, but not required. Excellent for special occasions and lots of space for groups! TWO is on the Atlanta Beltline and offers spectacular skyline vistas! In the warmer months, definitely ask to experience the beautifully appointed patio! Brunch features live music and awesome views of the Atlanta skyline. OF NOTE: Bob Amick, founder and owner of Concentrics Restaurants, of which ONE midtown kitchen is a part, won the Georgia Restaurant Association's Lifetime Achievement Award at its 10th Annual GRACE Awards Gala this past November. Thank you for coming along on what we think will be a FUN food journey over 10 months in 2017. Our selection of restaurants is a subjective selection of what we think will be an exciting new way to experience Atlanta restaurants: "By the Numbers". Please, tell your friends and family what we're doing and invite them to also come along for the taste tour!